It’s crystal ball time again. 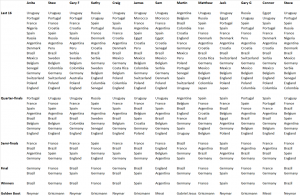 Just weeks after our Championship predictions were exposed as little more than random guesswork, the MFW team are putting what little credibility remains, on the line by offering up our World Cup forecasts. For those who fancy joining in, the rules are simple. The highest score from the maximum possible 63 points, will crown MFW’s champion tipster. But before sharing the team’s efforts, what else can we expect in the weeks ahead? You will draw Panama in the sweepstake at work. The person you dislike most and who knows nothing about football, will draw Brazil and say “are they good, then?”. The match that you can’t watch because you are at work, will finish 6-5. The ‘mouth-watering’ Iberian clash between Portugal and Spain, will finish 0-0. Without its novelty value, Iceland’s ‘Viking thunderclap’ will just be annoying. Glenn Hoddle will get slaughtered on Twitter for his mind-numbingly inane punditry. Mo Salah will win the race to overcome his shoulder injury and play in Egypt’s opener against Uruguay. Mo Salah will suffer a recurrence of his shoulder injury before half-time in Egypt’s opener against Uruguay. Cristiano Ronaldo will score a goal and take off his shirt. Another Portuguese player will score a goal and Ronaldo will take off his shirt again. Before every match, the cameramen will find stunningly attractive female fans from both nations to dance and smile at the camera. Raheem Sterling will score for England but the tabloid press will choose to run a story about how he allegedly once punched a ball-boy in the face. Sergio Ramos will crush the hopes of World Cup ‘minnows’, Iran and Morocco with some form of underhand ‘shithousery’. Supermarkets will sell St George’s flags to hang from all manner of places. People will use this to start arguing about Brexit. Antoine Griezmann’s transfer value will soar to £350 million. Someone will suggest that Norwich City should use the Maddison money to try to sign him. Ian Wright will over-step the fashion line between ‘interesting’ and ‘WTAF’. Despite not qualifying for the World Cup, stories will emerge of a bust-up within the Netherlands’ squad. Jamie Vardy will have a goal controversially disallowed by the video assistant referee. England will subsequently get knocked out in a penalty shoot-out. A tabloid paper will run the headline “VARdy-NIED”. Despite being the greatest player to ever play the game, Lionel Messi will not win the World Cup. A player you’ve not heard of yet will be the ‘surprise package’ and have an outstanding tournament. Your mate will claim that they signed him on Football Manager four years ago. Manchester City will actually sign him for a fee in excess of £150 million. ITV’s pundit, Patrice Evra will prove himself to be one of the world’s happiest men. 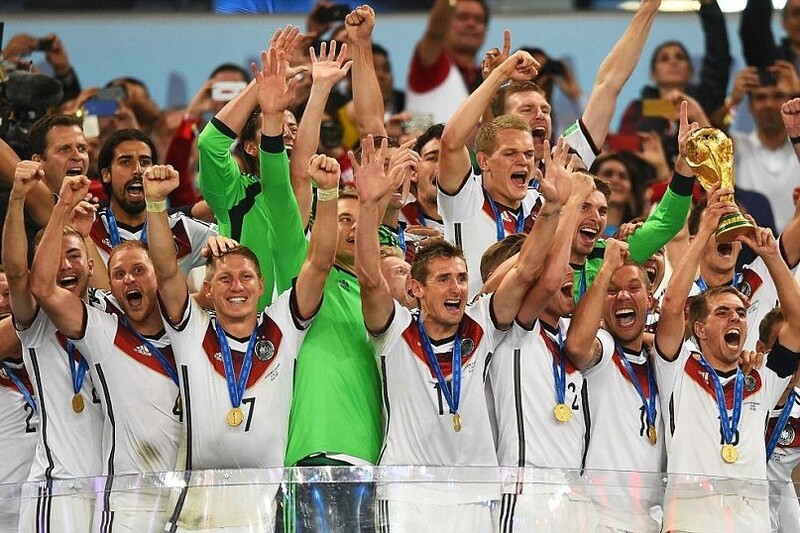 Germany will be rubbish but still get to the final. You will watch the final on the BBC rather than ITV. So back to the competition. It’s hard to look beyond the bookmakers’ favourites when predicting who will lift the famous golden trophy on the 15th July. Brazil will be boosted by Neymar’s timely return from injury and with the majority of their squad playing their club football in Europe, there should be no concerns about the South Americans adjusting to the host venues. The main European challenge is likely to come from Spain, France and Germany. All three qualified with ease but it’s probably the Germans’ uncanny knack of getting it together in tournaments that sees them as second-favourites. Messi’s hopes of glory are reliant on an experienced but ageing Argentinian squad, finding a defensive resolve under new coach, Jorge Sampaoli, to match their undoubted attacking threat. Ronaldo is another whose individual brilliance may not be enough to make up for the short-falls in the Portugal squad. Belgium’s squad is arguably as good as any, but the nature of tournament football has been the undoing of more than one country’s ‘golden generation’. A squad with the lowest average age and number of caps, is unlikely to suffer from the same weight of expectation as in previous tournaments and may benefit as a result. Anyway, for what it’s worth, here are the selections of the MFW team. To pit your mystic meg skills against ours, simply add your selections into the comments below. If any or all of the things listed at the top of this piece actually happen, each one will earn me a bonus point. I reckon I can take you all down ? Is it me or can anybody actually read the predictions?! No, they are fuzzy. Tried copying and pasting into something else, but that didn’t improve them. Hmmm, on my screen the choices you’ve made are so fuzzy I can’t read your names or your selections. I presume this is deliberate…. I do like all the scenarios you predict though. On my screen they’re all-too-clear….